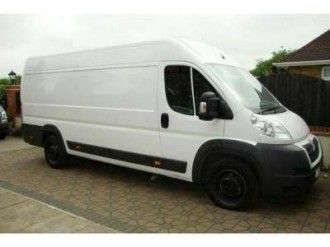 Man With A Van Oxfordshire Removals 01865 764569 or mobile 07788 837030 is a family operated Oxford removals company specialising in local and long-distance house and office removals. We're a well established removal company in Oxfordshire where we have countless satisfied customers. Read on to see how we can help make moving easier for you. 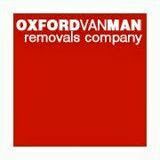 Removals Oxford and UK moves: We specialise in house and flat removals within Oxfordshire and offer full UK coverage. 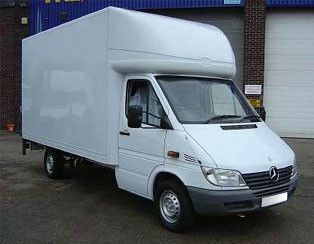 Using 3.5 tonne Luton vans or long wheelbase transit vans equipped with blankets and ties we ensure safe transit of your personal effects. Our team is equipped with tools for any furniture assembly requirements and we carry extra boxes and packing materials. 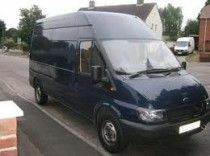 Our cost effective house removal service will safe you time and money. Our dedicated staff aim to make your house or office move run as smoothly and efficiently as possible. For moving house, office, flat, room or single item deliveries call us now for a competitive quote. Removals Oxford: We're here to see you through every stage of the moving process. Call 01865 764569 or mobile 07788 837030. Our professional and courteous staff uphold the highest standards of customer care. You can be sure that we will treat you and your belongings with the greatest respect as well as getting the job done fast. Find out more about our Oxfordshire moving services. Get a free online estimate. Or give us a call on 01865 764569. 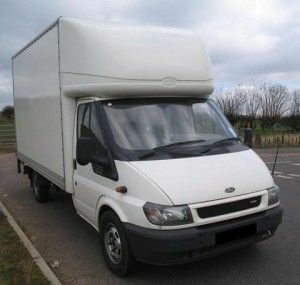 If you’re looking for a man and van in Oxfordshire, or indeed anywhere across the UK to help you move, we would be delighted to help. 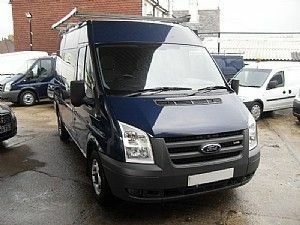 Whether you’re moving a single item or a selection of items from one place to another, our Man and Van service is the ideal, cost-effective solution for you. Our experienced and well-trained staff will collect and deliver punctually, efficiently and at a time to suit you. Ask us about storage and packaging! 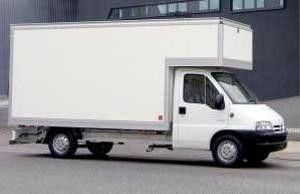 Whether you need a Transit, Luton or Extra Large Luton Van, one, two or three removal men, we have the answer to your moving needs. Just click the free quote link at the top left of the page or call the office on 01865 764569 to get a price and let us take care of the rest. 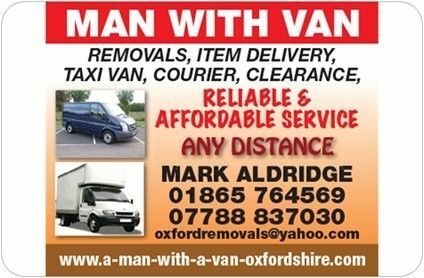 Man With A Van Oxfordshire specialise in all aspects of removals services for homeowners and businesses based throughout Oxfordshire & UK. We do not just move things around, we provide a comprehensive range of removals services, bespoke packaged to your exact requirements to incorporate full or part packing, short and long term storage options, moving of delicate, valuable and bulky items plus removals for both homeowners and small office businesses. With over a decade of experience and a business driven almost entirely by word of mouth recommendations we also take care to provide exceptional customer service from an experienced, permanently employed team of professionals. Helping homeowners from across the Oxfordshire region move house across the UK we provide a tailor fit package of services including packing, moving of delicate and large items plus short-term storage if you want to de-clutter or have a day or two break in your buying chain. We work hard to make a stressful day simple for our customers! Our team regularly works for businesses such as small to medium sized offices relocating to new premises or simply having an internal reshuffle. Our experience of moving around all kinds of bulky, heavy and delicate items means you can feel assured of everything coming together in your new location in perfect shape with nothing missing! Getting things like antiques or delicate furniture moved often comes down to the quality of the packing. So we offer full or part packing services to help make your move less work for you, and to ensure just the right packing material for every item; strengthened boxes for heavy books, anti-scratch covers for wooden furniture and plenty of shock proofing for delicates. Get an idea of what your move will cost quickly and easily using our online form, we just need the details of where you are moving from and to, plus an outline of how much there is to move, then we can come back to you with estimates on our range of services. Long Wheel Base High Roof Citroen Relay With Dual Airbags For Passenger Safety. 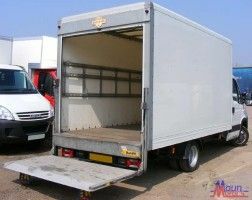 Man With A Van Oxfordshire Removals 01865 764569 or 07788 837030 also offers on-site storage facilities to meet all of your short or long-term storage needs. We have everything from mini-storage units to large, climate-controlled spaces. Find out more about our Oxfordshire storage services. Domestic removals helping homeowners move from Oxfordshire to locations across the UK have been at the centre of our business throughout our ten-year history. Throughout that time we have developed a range of removals services designed to make a typically stressful experience as simple, straight forward and stress-free as possible. We provide our customers with as much advice and support as they require in planning a move helping organise packing and storage as well as carrying out the move itself. With plenty of experience handling antiques, pianos and other valuable but delicate items we are an ideal choice for your move providing a complete, bespoke fit package of services. We are proud to offer a service which is sustained almost entirely by word of mouth recommendations, working hard to provide a really exceptional customer service experience that people want to recommend. 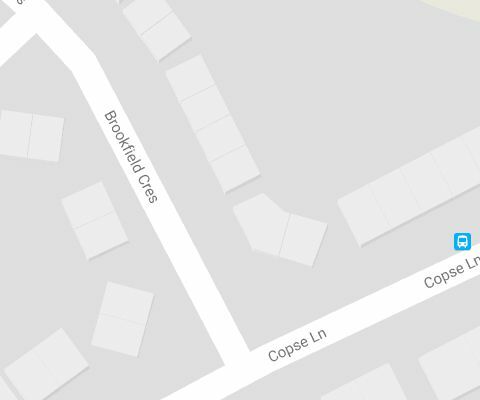 Our team, who are permanently employed and uniformed professionals, provide removals for very large detached properties and small terraces, adapting the service to fit your needs and always bringing a friendly, understanding and dedicated attitude to every move. Whatever your home removals needs, speak to the experts at Man With A Van Oxfordshire for the total service to a market-leading standard; contact us today to arrange a no obligation quotation with one of our friendly team. Minimise the disruption to your business caused by a move working with the team of highly experienced removals professionals at Man With A Van Oxfordshire in Oxford. We bring over a decade of experience to commercial office moves, helping businesses relocate from across the Oxfordshire region to new premises throughout the UK. Highly recommended by previous clients including many estate agents we offer a comprehensive range of removals services that can be bespoke packaged together incorporating removals, packing services and storage facilities if required. Our team is permanently employed; we never use agency staff which enables us to guarantee you highest quality removals and an exceptional level of customer service. Big enough to handle most office moves, but still small enough to care about the quality of service we provide, our team guarantee work that exceeds client expectations. We also provide businesses with contract delivery services, often working with companies like furniture retailers to deliver sofas, beds and other large items throughout the Oxfordshire region. Get a comprehensive and bespoke solution to your office move from the dedicated team at Man With A Van Oxfordshire Removals; contact us today to arrange a no obligation quotation with one of our experienced team.